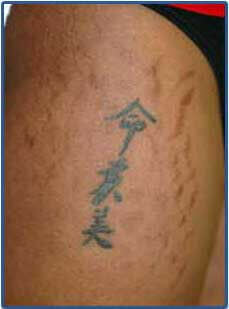 We really want to emphasize to you that laser treatment for stretch marks is a very individualized process. No two skin types are quite exactly the same and neither are stretch marks. Even on the same person, individual stretch marks may look and feel different and therefore, require different laser treatments to each! What worked for your friend or sister, may not work for you! But rest assured, the expert laser practitioners at Celibre have years of working knowledge and experience under their belts when it comes to treating pesky stretch marks. We’ve helped thousands of patients in the Los Angeles and Orange County area get rid of their stretch marks and we can help you too. Celibre Medical Corporation will use up to four different, state-of-the-art lasers to treat your stretch marks. Some of our lasers are designed to create a thermal or heat injury deep in the skin. This will trigger your body to replenish and rebuild the collagen and elastin that’s been damaged. By doing this, the texture of your stretch marks will improve a lot! Giving the skin back its suppleness and flexibility helps it look and feel more like normal skin. If your stretch marks are red, we can use our pulsed dye laser to help. This device targets the multiple, fine little blood vessels in the stretch mark. And while it may look a bit bruised initially after treatment, this will fade and make it look more like your natural skin tone. If you’ve got dark or brown colored stretch marks, we’ve got our q-switched laser to help you. This laser is the one we use to treat age spots and tattoos. It “sees” the pigmentation or melanin that is in the stretch mark, which gives it the dark color. It will help to fade it back to your normal skin color. In general, treatment with any of these lasers can cause you to have a hot or prickly sensation as the laser hits the skin. Depending on the number of stretch marks that we’ll treat, most treatments take about 15-60 minutes to do. Most of our patients will tolerate their treatments just fine in that time-frame. Of course, we will always do everything possible to make your treatments as comfortable and pleasant as we can, so just let us know if there’s something more we can do! Please don’t let another day go by worrying about your stretch marks. Give us a call today. We offer free consultations, and we can provide treatment in either of our conveniently located offices in Los Angeles or Orange County. Laser treatment works. Join the list of our patients who we’ve helped get rid of stretch marks!